A perfect theme for Lawyers that not only loads fast but actually helps you generate more leads and convert more prospects. Lawyer theme does two things really fast – load and convert visitors. A perfect, beautiful, intuitive and practical design that delivers world-class performance – all in one, mega package. Time is valuable. Don’t let your visitors waste that on a slow-loading website. 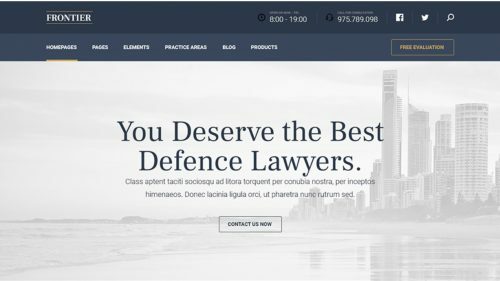 Get the Lawyer theme and make your website load fast. With our themes, you are guaranteed to get a no-bloat codebase that doesn’t create unnecessary PHP calls or add any extra loading time. Change your fonts, colors, font size, font weight, etc. – all with the click of a button. Easy, right? Have a pre-determined set of colors you want to use? Don’t worry, with Lawyers theme – you have unlimited color choices. Whether you want to set a solid color as your background, a pattern, or a custom image – you can with the premium Lawyer theme. Backup your website’s settings easily or transfer your settings to multiple website in one go using the import/export settings. As if the fast loading speed of Lawyer theme wasn’t enough, we have included even more performance options to improve the speed. Give credit to a post’s author using the attractive author box that the Lawyer theme is equipped with. Add or remove ads on the fly with the Lawyer theme’s bundled ad management options that allow you to take control of your ads. Let your visitors be your website’s advocates (pun intended) by making it easier for them to share your content on social websites. Want to customize it further using custom code but don’t want a theme update to remove your changes? One Click and a child theme is created.